The purpose of this trip was to check batteries and download charge controller data. Dale (K7FW) and Mary Jo (KB7NJE) made the trip. The batteries did not need much water at all. This is likely because very little charging has been done since the last visit on November 17. The battery voltage was 12.97 and specific gravity was 1.275. 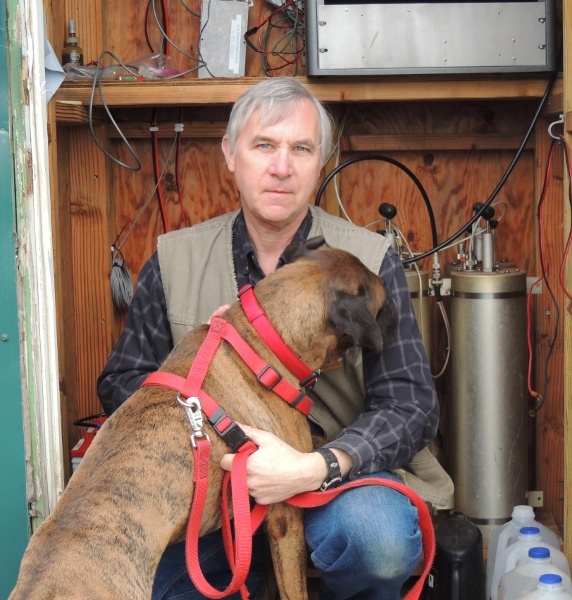 I took a gallon of distilled water to the site so we now have one and a half gallons of distilled water at the site. I downloaded the data from the solar charge controller. (See this page for raw data files.) 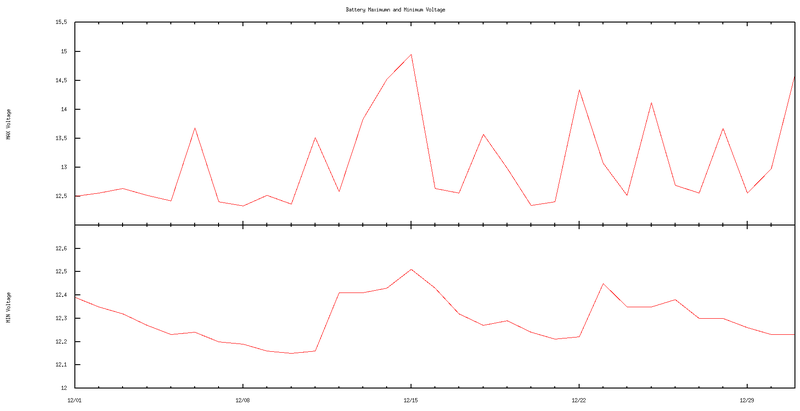 The charge controller was installed July 29, 2012 so we now have six months of data (August 2012 through January 2013). Bulk Charge Stage: In Bulk charging stage, the battery is not at 100% state of charge and battery voltage has not yet charged to the Absorption voltage setpoint. The controller will deliver 100% of available solar power to recharge the battery. 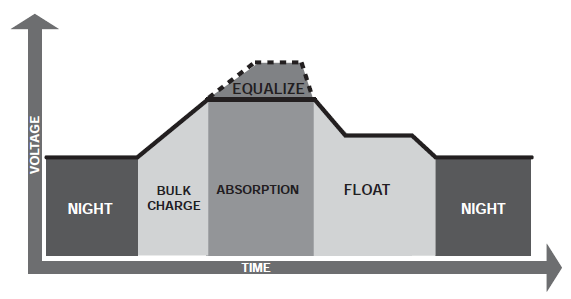 Absorption Stage: When the battery has recharged to the Absorption voltage setpoint, constant-voltage regulation is used to maintain battery voltage at the Absorption setpoint. This prevents heating and excessive battery gassing. The battery is allowed to come to full state of charge at the Absorption voltage setpoint. chemical reactions and all the charging current is turned into heat and gassing. The fl oat stage provides a very low rate of maintenance charging while reducing the heating and gassing of a fully charged battery. The purpose of float is to protect the battery from long-term overcharge. December seems to represent a poor month for solar power. 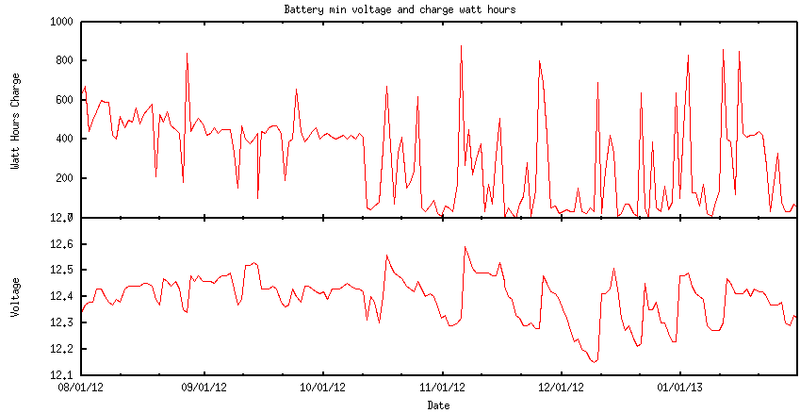 Here is a graph showing watt hours into the batteries and minimum battery voltage for December, 2012. The graph links to a larger image. The minimum voltage seen was 12.15 volts on December 10th. The standby current I measured on May 4th 2011 was 350 millamps. If we figure 13.5 volts (float stage) we need 113 watt hours a day to break even. This of course assumes 100% efficiency. I have read that the solar industry typically figures 85% efficiency. Given our older batteries we are likely not that good. This last chart shows the battery maximum voltage (top) and minimum voltage (bottom). Note that the scales are not same for maximum and minimum. 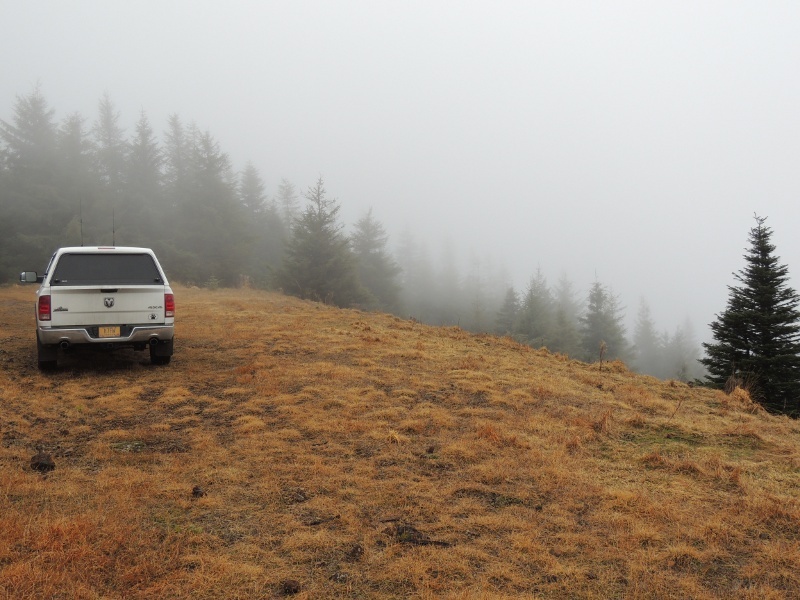 The radio site was in the clouds when we visited. No view of the ocean on this day. 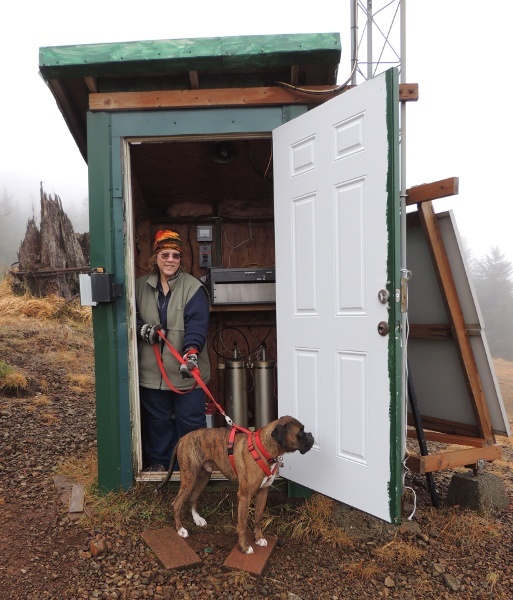 Mary Jo with our boxer Oscar. Dale with our boxer Oscar. 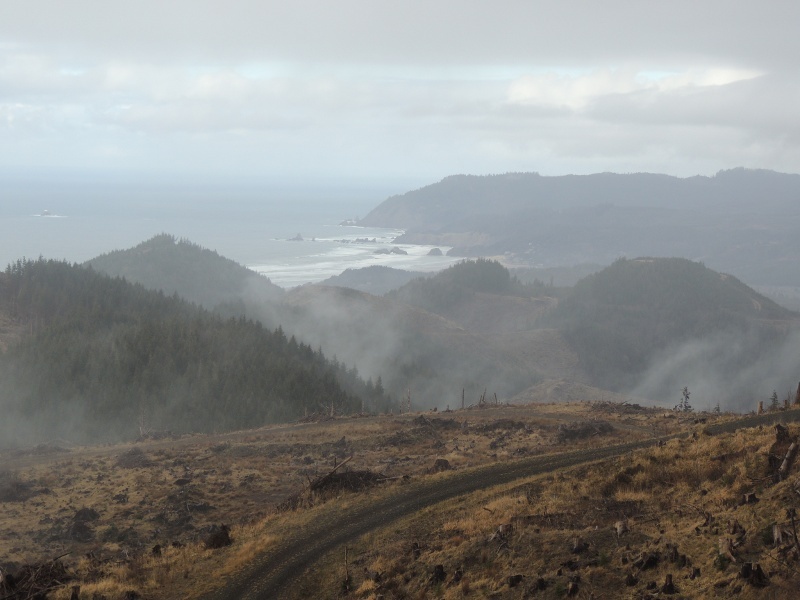 Once we got a bit lower we could see the coast through the mist.